Twenty years after the disappearance of the girl he was once enamored with in college, George Foss spots her in a restaurant one night. He is having dinner with his girlfriend, but goes back later in hopes of spotting Liana. For George's sake, it would have been better if Liana had stayed disappeared, but George's sense of loyalty to his ex-flame is driven by his libido and not his intellect. George will make some stupid decisions along the path of this twisty thriller, but we will follow along willingly, hoping at some point he'll smarten up. This is a simmering page turner, perfect for a long winter night. 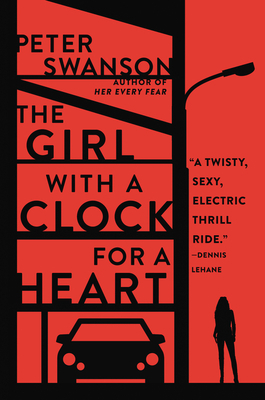 Already optioned for film, The Girl with a Clock for a Heart is Peter Swanson’s electrifying tale of romantic noir, with shades of Hitchcock and reminiscent of the classic movie Body Heat. It is the story of a man swept into a vortex of irresistible passion and murder when an old love mysteriously reappears. On an ordinary Friday evening at his favorite Boston tavern, George Foss’s comfortable, predictable life is shattered when a beautiful woman sits down at the bar, a woman who vanished without a trace twenty years ago. Liana Dector isn’t just an ex-girlfriend, the first love George couldn’t quite forget. She’s also a dangerous enigma and quite possibly a cold-blooded killer wanted by the police. Suddenly, she’s back—and she needs George’s help. Ruthless men believe she stole some money . . . and they will do whatever it takes to get it back. George knows Liana is trouble. But he can’t say no—he never could—so he makes a choice that will plunge him into a terrifying whirlpool of lies, secrets, betrayal, and murder from which there is no sure escape. Bold and masterful, full of malicious foreboding and subtle surprises, The Girl with a Clock for a Heart is an addictive, nonstop thriller—an ever-tightening coil of suspense that grips you right up to its electrifying end.